When it comes to natural beauty, particularly of the limestone karst surrounded by water variety, Vietnam seems to have it in alarming abundance. Halong Bay, Phong Nha-Ke Bang National Park, Tam Coc, the Perfume Pagoda. This is just the start. So it comes as little surprise that with so much competition out there Van Long, just a short drive from Hoa Lu in Ninh Binh, barely gets a mention. What this means is that this wetland nature reserve, one of the last strongholds of the fabled and almost extinct Delacour’s langur, remains refreshingly devoid of tourists. It also means that those eking out a living off tourists remain genuine, friendly and unaffected — a pleasant change in a country where money-wielding holidaymakers get the walking cash machine treatment. The adventure starts on entering the gates of the reserve. A VND15,000 fee gets you inside. Bamboo boat or sampan rental, rower included, costs a mere VND50,000 for an hour and a half. It's a trip that takes you across a shallow lake and through the complex of mountains that form the reserve. Not only is it peaceful — here the only noise you'll hear is the cawing of birds, the calls of the langurs and the sound of you or your companions’ voices — but you sense that life here is no different to how it would have been 100 years ago. The first fisherman we come across is collecting crabs. He shows us the crawling, pincer-wielding contents of his bucket. 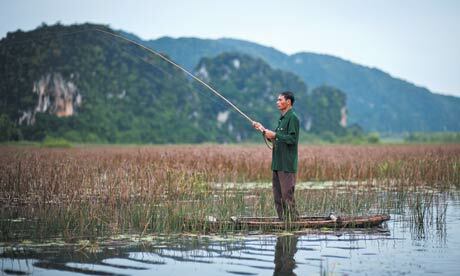 And later on we see another fisherman, hand-made bamboo rod in hand, reeling in his catch. As we pass between two mountains into a fresh stretch of water there is a small cry from the boat in front. The only other canoe here during the period we're touring the karsts, they've spotted two langurs. Sat on a tree way up on the summit of a mountain, we don't have a clear view of these two-stomached mammals that pre-date the evolution of the monkey, but they are certainly visible. The giveaway is the white fur on their rumps and legs making them look like they are wearing trousers. Take a telescope at sunrise or sunset and you will get a clear view — sightings of the 40 or so animals in the reserve are common. Fortunately for this lady, tourism, or what little there is of it, and the arrival of the Emeralda resort on the edge of the reserve have helped her and her family move beyond the stage of just satisfying their basic needs. Let's hope others are also reaping the rewards. Information: Van Long is approximately 90km south of Hanoi just off provincial highway TL477, a short distance from Highway 1. There are two accommodation options on the edge of the nature reserve — the three-star, Van Long Resort (www.resortvanlong.vn) and the beautifully set up five-star Emeralda (www.emeraldaresort.com). Built like an imperial-styled Vietnamese village, the latter has been designed to merge into with the wetlands environment of the reserve.